Discovery Science Channel’s How It’s Made Visits Desert Whale to Film How It’s Made: Jojoba Oil. 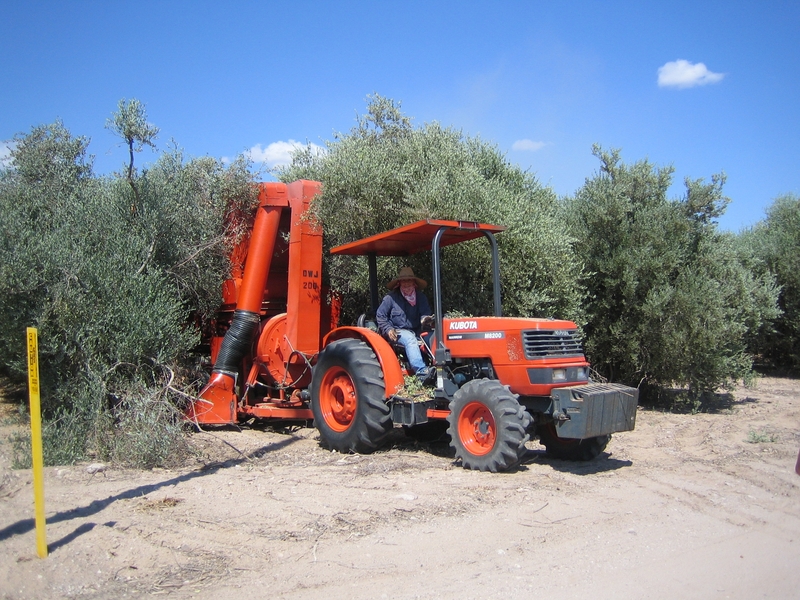 A DWJ harvester prepares to vacuum up jojoba seed. As the largest grower of conventional and organic jojoba in the United States, Desert Whale was approached by the creative director of the Discovery Science Channel’s hit documentary television series How It’s Made with interest in filming How It’s Made: Jojoba Oil. A four man crew visited Desert Whale last week to get a behind the scenes look at the transformation of the jojoba seed into jojoba oil. The filming included a trip to Desert Whale‘s expelling plant as well as a visit to Desert Whale‘s farms to watch the harvest and seed cleaning. Desert Whale was pleased to be chosen to represent the industry. An air date has not been set, but stay tuned as we will share the date as soon as it becomes available. DWJ's president and farm staff with the How It's Made crew. This Season Plant the Seed of Hope! This year Desert Whale made a donation to support sustainable. organic farming projects for women who have survived war. For more information on this charity please visit http://www.womenforwomen.org. 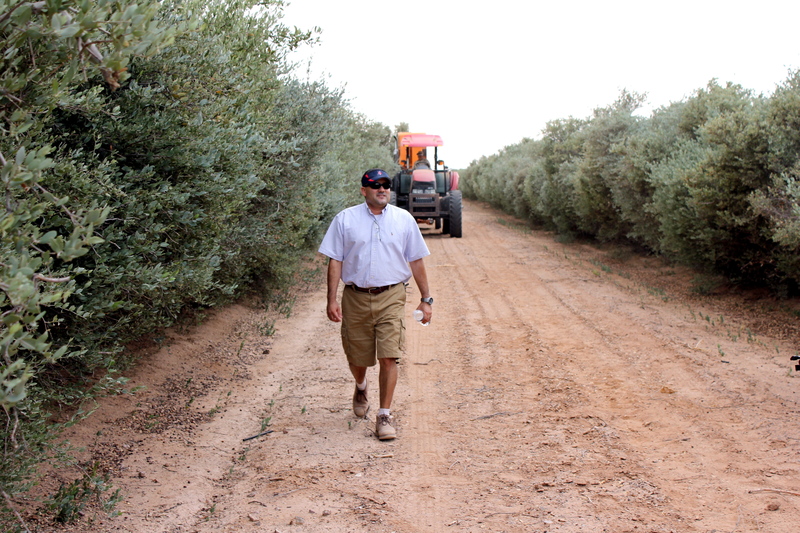 Watch this video to see what our organic certified jojoba farms in Arizona look like. Also, learn some history about our company and why exactly we are called “Desert Whale”. Due to consumers becoming more aware of the environmental and social impacts behind the beauty products they purchase, it is becoming more and more important for personal care manufactures to put CSR at the forefront in their decision-making. Companies are implementing CSR into their business plans in a variety of ways. Whether it be through environmental sustainability, philanthropy, or helping women/minorities. To read what many multi-national companies are doing please read this article by Leah Armstrong. – On our farms, no roads are paved and nothing is added to the soil that isn’t native to the environment. Aside from all of our farms being pesticide-free, we recycle our jojoba cake to reuse on our farms. By doing this, we reduce solid waste and replenish the soil with natural nutrients. – In 2005, Desert Whale set aside 80 acres of land for conservation. – Last year at Christmas time we donated to the World Wildlife Fund and helped support 8 different endangered species. – Desert Whale invested millions of dollars in rural communities, Indian reservations and land cooperatives in Mexico. When you use Desert Whale as a supplier you know the raw materials you get are in no way detrimental to the environment and you can be positive you are helping support our philanthropic and social efforts in a meaningful way. For more information on Desert Whale’s sustainability efforts please contact marketing@desertwhale.com. At Desert Whale Jojoba Company, sustainability is a seed we planted over 30 years ago. In the 1970s, as sperm whales were being hunted near to extinction, cosmetics manufacturers discovered the remarkable qualities of Jojoba—a native plant of the Sonora Desert. Jojoba possessed unique characteristics that made it an ideal substitute for sperm whale oil in personal care products. Acting on a vision, the founders of Desert Whale developed a plan to market Jojoba on a large scale. The result would not only reduce pressure on an endangered ocean creature, but would expand the use of a naturally renewable plant resource. From the beginning, Desert Whale was connected to the soil. We spent our earliest years harvesting wild Jojoba seed by hand. Over time we acquired 2,500 acres of land—allowing us to establish a reliable supply chain and implement farming practices consistent with our mission. Today, our land stewardship includes composting and tilling seed residue back into the earth, thereby reducing solid waste and replenishing nutrients to the soil. With more than 570 acres certified as organic, we are the largest all-natural producer of Jojoba in the world. Responsibility and sustainability extend to our employee family as well. Desert Whale, a woman-owned company, provides housing opportunities for our farm workers and sets high standards for agricultural working conditions. Our goal is to ensure that all employees feel proud to work in a diverse, empowering environment where ecologically sound practices are followed. For Desert Whale, being green isn’t about joining trends or jumping on bandwagons—it’s about anticipating the fundamental desires of our customers. As more consumers demand natural personal care products, Desert Whale provides the pure, functional raw materials that manufacturers seek. Our Jojoba oils, butters, waxes, gels and exfoliates provide superb stability, versatility and elegant skin feel—and all come from a natural, renewable source. As caretakers of a fragile desert ecosystem, sustainability is grounded in who we are and all we do. Desert Whale is committed to the environment, to our workers, to our manufacturing partners, and to consumers who share our passion for pure. Desert Whale lives up to the expectations of customers who want their cosmetic products to be pure in the bottle and clean in conscious. Please e-mail marketing@desertwhale.com for a price quote on ecofriendly, natural, ECOCERT, and organic cosmetic ingredients today! Check out our video on our website and/or youtube!